When choosing which cable provider to sign a contract with, you will undoubtably check the channel guide to see which channels are included in the package to which you are about to subscribe. You may even go a bit further and check to see if includes the HD version of your favorite channels. What you likely will not do is check to see how many channels have allowed the cable provider to access their shows from within an app on the App Store. Despite having a growing number of channels to choose from — 189 channels on average — Nielsen data shows that most homes view just 17 different channels. Using a list of broadcast networks, the 20 most watched cable networks of 2013, and some of the top premium channels, you will find that each and every one of the top 20 networks has an iOS app in the app store. The problem is that many of them may be of no use to you as some of your favorite channels’ content will not be accessible to you at all. Local television stations, or affiliate stations, usually have apps that are free to use and do not require any sort of subscription to a major cable provider. The easiest way to find these apps is by searching in the App Store using your local stations call letters. With a style that is more like that of a local newspaper, these apps typically offer up local news, sports and weather forecasts. Some have started to simulcast live broadcasts at the times when they air their own produced shows locally. If you look at six of the main over-the-air television networks, you will find full episodes of prime time and late night shows you are interested in watching. What you may find surprising is that both ABC and FOX will require you to log on with your cable provider’s credentials in order to unlock premium content. NBC and The CW do not have this requirement and will allow you to catch up on your favorite shows by providing access to full episodes that have recently aired without a cable provider. CBS, also void of such a restriction to content, has gone more social than the others by syncing with select programs using the microphone as they air. This provides a more communal watching experience as you can log on and share opinions about the CBS show you are watching. When it comes to accessing the full content for each of the basic cable channels using apps found in the App Store, you will need to log in with credentials provided by you cable provider. However, not every cable provider will be able to grant you access to the premium content within each network’s app. 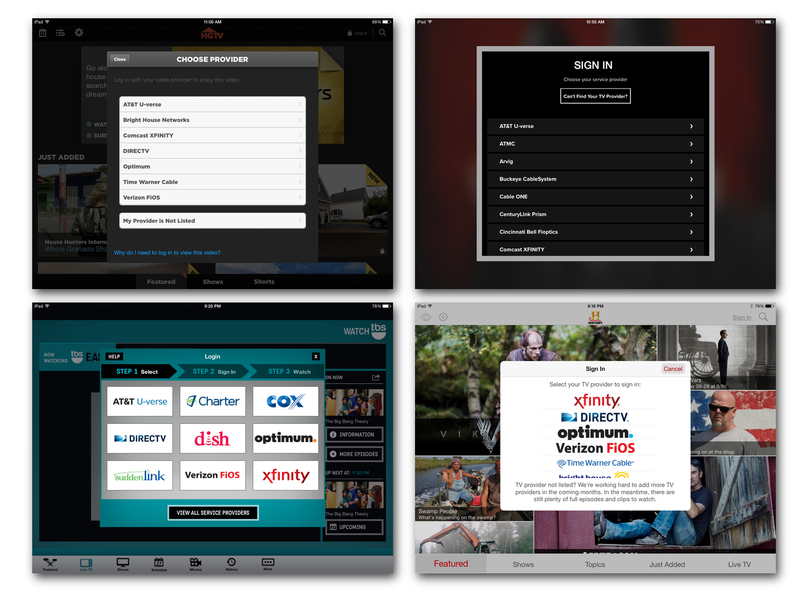 Using a list of the top ten networks for 2013 and 20 of the nation’s leading cable providers, each network’s app is accessible by only 12 out of the 20 different cable providers listed. 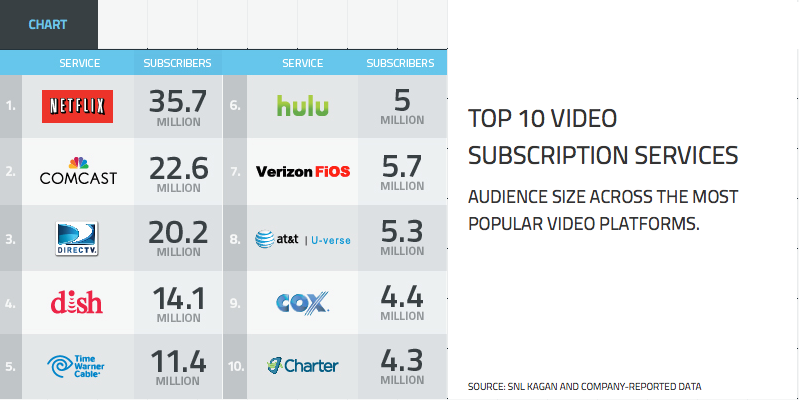 Looking at it the other way around, on average each cable provider can only access content on six of the 10 of the most watched networks’ apps. Either way you have about a 60 percent chance of being able to access the premium content of your favorite network. Comcast was the only provider that could access all 10 networks whereas Time Warner was one of the providers providing access to apps from just six networks. As you start using multiple channels’ apps more and more, you will begin to see a pattern in the way that some of the channels apps are designed. And no, this is not entirely due to the fact that episode lists, channel guides and special features can only be organized in so many ways. This is because companies like bottle rocket and dreamsocket are responsible for the development of many of the network’s apps. It would be great if more networks worked with such developers and focused more on a consistent experience. I am not going to start watching a bad show just because it has a great app, and I certainly will not stop watching a great show due to the fact that the network it is on built a terrible app. While all premium cable channels require you to have a subscription with a cable provider in order to access content, you will likely be asked to create a personal account with the service as well. Why the extra step is required is a mystery to me, especially since you cannot keep or log on to this account when switching cable providers. After switching from AT&T U-verse to Time Warner, I was forced to create a new accounts for several of the premium channels I subscribe to. All of my old accounts still existed, I just could not access them. What is great about premium cable apps is that you seem to get full access to complete episodes for all of the back seasons of the show. You can even find older series like all six seasons of the Sopranos on HBO as well as all eight seasons of Weeds on Showtime. Providing a more complete experience, cable providers’ apps share a consolidated program guide that includes a 24/7 listing of all of the network’s programs. Individual networks’ apps only provide you with the time that their prime shows air. Many cable providers now allow you to watch live TV and access an expanding list of on-demand content from each of the network channels included in your subscription. Even content from providers whose apps you could not log on to individually. The number of episodes and seasons available will vary from network to network. The main advantage of using a network’s app over the cable provider’s app depends on whether or not the network has also added additional content and special features that the cable provider would not necessarily have access to. 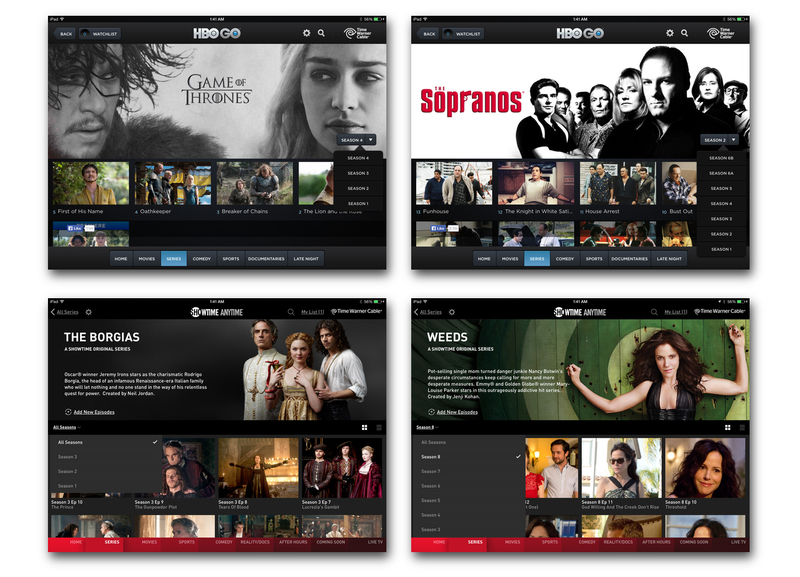 For the most part, the cable provider’s apps do not include access to webisodes, behind the scenes clips, and other special features included with some networks’ apps. The most useful feature of the cable providers’ apps is the built in Wi-Fi remote control of your cable box. Access to your DVR list allows you to remotely and add programs to your recording schedule when you are not at home. Unfortunately for both AT&T as well as Time Warner, the two cable providers that I have subscribed to in recent months, I have not been able to access and play back recorded shows stored on my DVR. Sure, there are definitely more direct ways of watching your favorite television program on an iOS device. Locating and activating just 20 different network apps can take some time. But if you are already paying for cable television, you should look to see if you already have access to the shows you want to watch before buying multiple seasons on either iTunes or Amazon or filling up your DVD queue on Netflix. If and when Apple decides to update the Apple TV to include a wider selection of the most popular channels, one could look towards what the App Store already has to offer as a sign of things to come. If that is the case, be prepared to spend some time logging on to each and every channel, and being disappointed because your cable provider does not yet have a deal with your favorite network about 40 percent of the time. I agree that Apple iOS will ultimately be a better cable box because it’s mobile (similar thoughts expressed here: http://www.transformativecompanies.com). This is partially why Apple is buying Beats: to take the first steps toward creating a bundled package of streaming content that over time resembles the tiered programming structure that cable uses today. Coupled with elegant hardware (subsidized by the carriers) and all-you-can-eat pricing, the value proposition could be pretty compelling. Other than access to a few local channels, if you can carry your set top box with you in a variety of sleek form factors with simplified billing, why do you need a cable company? I think that’s why Amazon is working so hard to develop a robust streaming music offering to package with video and a new hardware device, all sold under the Prime banner. Google is similarly scrambling to craft a comprehensive offering to bundle with Android smartphone/device partners. It won’t happen tomorrow and the networks will ride the cable affiliate fees as long as possible, but I think you nailed it in this post. The government, since it’s got it’s nose in all the rest of our business, should require ALL cable providers to sell us the coverage we chose on an individual basis. I’m tired of supporting crap like C Span, Spanish language channels, home shopping channels, day time soaps, left wing media “news” and the like. Give me what I want not what YOU want me to buy. Network/program Apps offer a big opportunity to experiment— even on a genera basis–with different forms and styles of display, navigation, extended features etc, with intuitiveness in mind (so that moving from App to App is not disorientin)g. The “evolution of all this” will thus entail some natural selection, and, given our meager ability to model this, have an uncertain outcome. Or, more positively, if you think there are “fitter” combinations of content and features than those in the ecosystem today, build your mutant versions and compete. Iâ€™d be curious to see an article in which you outline your thoughts of what you think the evolution of all this is, especially for the TV space. I started Dreamsocket, so Iâ€™ve been living and breathing this space for years and have my own opinions. Unfortunately Iâ€™m limited in what I can say publicly. Iâ€™m very keen on what others think. I just did not like having to log in over and over with the same credentials. A shared authentication model is in order if things continue down the same path. Perhaps something similar to the way UltraViolet works. One “uber” account that holds all of the information as to which networks I am permitted to subscribe to. Then no mater which qualifying cable provider I subscribe to, (e.g. instead of TargetTicket, U-Go, VuDu, etc. it would be Comcast, TimeWarner, AT&T etc.) I would have access to my subscribed channels content. That way any hardware vendor or app developer that license access to the “uber” account APIs could provide access to the content that I pay for through each cable subscriber. Again, this would be in an effort to preserve as much of the existing system as possible, yet allow for some ease of use and more consumer friendly experiences. Not a complete overhaul of the currently outdated system. I agree that going from app to app and logging in with Comcast several times is a bit cumbersome. If you look at its progress in the past year alone it has gotten much better. More providers have been added, cross app logins with parent companies exists. It evolves. However, in terms of even logging in, I’d actually pose the question, why do you have to login at all? Not to say that you don’t need a provider to access the content, but why do you need to physically have an account and access it. Think of it in context of watching cable today, you don’t have to log in to get access to your channels, your connection knows. Remember that the authorization model is relatively new, what you see today isn’t what you’ll see tomorrow, if this model persists it will evolve. I would imagine that with the right systems in place you could authorize a device against a connection. This would allow you to login without logging in. I know nothing about plans for this or how feasible it is, I just imagine that it has to be possible. I also know that the less friction you have getting to your content, the more it will be consumed. Thus, I would assume sooner or later it will be explored by the providers. I’d also say that this is less on the shoulders of networks and more on the shoulders of providers. The networks do the best they can stringing them all together. I could be way off and I imagine its harder for some providers than others, its probably also hard if you have an AT&T phone and Comcast cable, but that’s how I imagine it playing out if this model persists and grows. OR.. that’s at least how I’d like to see it play out. Again I have no clue, its just me rambling. It is important to note that the authentication model is just one of many. I don’t know if it is the end model. It is fundamentally rooted in a traditional financial model and makes sense for businesses today. Will it in a few years, we shall see. If you want uncertainty look at what happened to the music industry. That is not to say you will see the same model emerge. The fundamental difference at the consumer level between the two is that people like to replay music over and over and in a sense own the right to do that, while TV and movies are the inverse of that. In addition, consumers are willing to accept physical breaks in the content with ads, try doing that in a middle of a song (though Spotify does it between songs like traditional radio). The fundamental variance at the content produce level is quality. Try creating a movie like Transformers yourself. The music industry and broadcast industry aren’t 1 to 1, otherwise there would have already been an implosion. That isn’t to say authentication is the only model. Obviously if you just take the simple dynamics of how consumers tend to consume the content you start to realize what will work. Look at examples like NetFlix, Amazon Instant, and others. Those play to this consumption model. That said, my question on evolution was more around the TV space in general. The title of your article centered around iOS being better than the Apple TV and ending with iOS currently supplements what the Apple TV should have. With that in mind, there is an obvious gap there currently. Apple TV, Amazon TV, etc aren’t disrupters in their current form. They are more or less novelties. The TV space has been sitting on the edge for quite some time. Nothing has pushed it over. I think about this constantly and definitely have opinions there. It is inevitable that there will be a tipper. The living room space has deteriorated, but it still lives strong even with some of the generational gaps. Once you master this final frontier the whole game changes. What are your thoughts there? What does the future hold? PS. How in the world did you find Dreamsocket? We do not publicize ourselves other than mentioning projects we finish to friends. In fact, we pretty much hide because we are very selective with our work and our clients. We do not pursue work for that very reason. We are less about how much work we can do and more about what level we can do. Our site is really only there for when we court developers. It helps let them know we are legit. Needless to say, I was a little shocked when I saw the company referenced. We might need to do a better job at hiding ;). I’ve heard that Xfinity’s “X1” box can do that, but for the multitudes without that, you might be able to use a Slingbox. Basically you need something to convert video from MPEG-2 to the MPEG-4 format supported by mobile devices and send the video over your LAN. The headline is misleading. A cable box or Apple TV allows me to watch TV on my TV. iOS apps allow me to watch TV on my iOS device. No matter how many channels it gets, I will never think my iOS device is a better cable box than Apple TV, because I don’t want to watch TV on my iOS device. Yes, there are solutions to this problem as noted in other comments, but all of them require me to connect some other box to my TV. An iOS device is not a cable box. The comparison I was going for was the ability of the cable box to ‘tune in’ your favorite cable channels. That is something that an iOS device definitely can do better than the Apple TV (depending of course on which cable provider you have and which networks you are permitted to access). The intent was not to mislead you. Neither the Apple TV nor any iOS device can channel surf and flip through the channels in a similar fashion to what you can do with a traditional cable box. Both can be directly connected to a television via HDMI. Neither can perform the functions of a DVR. And only the Apple TV can be controlled with a remote control. If you cannot get to the content, in this case network television, you are less of a cable box. The App Store currently serves up more network television than is available on the Apple TV. Sorry about the confusion. In most cases, I stream from the iOS app via AirPlay – through my AppleTV – to our TV set. Apple makes it easy. AppleTV makes it easy. Most of these feeds are also available on the web. Some of them require you to validate your cable subscription plan. Others are freely accessible. I am mentioning it because I have recently released LeanBack (http://getleanback.com), a Mac OS X application (Windows version coming soon) that offers the ability to “cast” any Mac OS X to either the Chromecast, the Roku, Apple TV or any HLS-enabled soft. or device. It is basically like “the Chromecast tab casting on steroids”. It opens the ability to stream tons of cable content without being limited to the Apple TV platform. Once you get outside of the top twenty most watched networks here in the US, you are not guaranteed to even find an app in the App Store. SyFy is one that does have an app in the App Store whereas BBC America does not, at least not in the US. 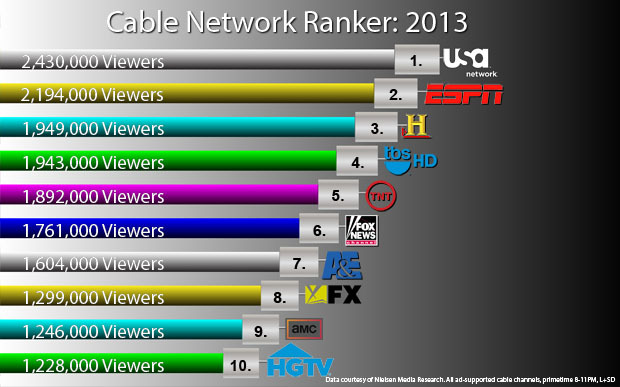 Across all cable providers there are over 900 different cable channels that are available. 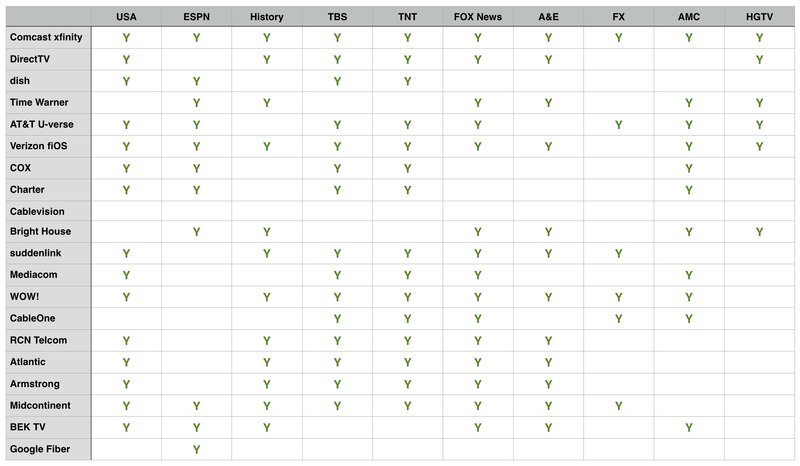 On average each household has access to about 189 if these channels while only watching 17. That is why I decided to keep the list to just the ones that are at the top of the most watched list. SyFy may have simply not secured mobile streaming rights for enough of their shows to make creating an app worthwhile. I’ve stopped watching SyFy myself. There’s much more horror shows than sci-fi ones on there these days. However, I’ll probably watch the episodes I haven’t seen of Warehouse 13 when the come to Netflix. Yeah, I wish BBC America had an app. Some content from them can be watched on Xfinity’s mobile app though. Any idea what percentage of the 900 channels are regional sports or news? Finding good, up to date sources for information like that proved to be a challenge. I linked to all of the data sources that were quoted in the article. The chart of which providers allowed access to which shows was assembled manually by downloading each app and checking the list of supported cable providers that was listed within the app. And some apps had very long lists. FYI: Another interesting fact (also from the NCTA) is that there are 660 different cable operators and some 5,208 different cable systems. That sure is a lot of different people to try and get to come to consensus on how cable television should behave within an app.